"'Amazed' and 'excited' would be good words when you came across new work by Ralph [McQuarrie]." With Star Wars on everyone's mind, there's no better time than now to feature these five segments of a mini-documentary about concept artist Ralph McQuarrie. McQuarrie's work on the Star Wars series is iconic, representing much of the look and feel of the world that was later translated into celluloid by George Lucas and his crew. There's a feature-length doc about McQuarrie in the works already, but in the meantime Lucasfilm (via Gizmodo) has posted separate 7-minute segments, featuring interviews with Lucas' crew. As a solid recap of the man who imagined the sci-fi world we all love, this is quite engaging/fascinating to watch. For all the latest updates on Star Wars and The Force Awakens, click here. Re-watch the first teaser trailer. 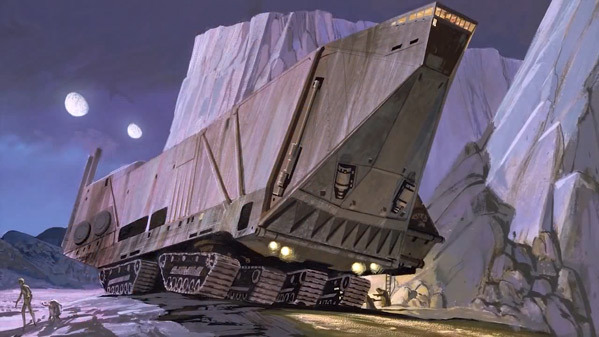 Description for this specific set of video segments from YouTube: "Ralph McQuarrie, concept artist of the original Star Wars trilogy, was essential in bringing the characters, ships, and locales of a galaxy far, far away to life. In this special retrospective, Star Wars creator George Lucas, Industrial Light & Magic effects legend Dennis Muren, and many others discuss the impact of McQuarrie, his artistic gifts, and his legacy. This is part of the Ralph McQuarrie tribute Dreams and Visions Press produced for Star Wars Celebration VI in 2012, drawing from interviews conducted for a feature length documentary on Ralph McQuarrie that is currently in production." There's more? Perhaps. However, these segments are already wonderful to watch. Very Cool! I once tried to come up with an original concept. Turns out, it is pretty hard to do.